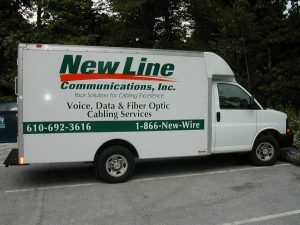 New Line Communications, Inc. is a privately held company specializing in the design, installation and maintenance of all types of voice, data, video, paging, fiber optic communication systems, and distributed antenna systems. We have built a strong reputation for developing and delivering innovative, cost effective, customer-focused solutions to meet your structured cabling needs. We are equipped to deliver design, planning, project management, installation and maintenance of structured cabling systems. Our headquarters is located in West Chester, PA where we employ an extensive staff of cabling technicians, project managers, estimators, and an executive level of management with over seventy years of combined experience in the telecommunications industry. Our experience spans a wide array of project types including new construction, outside plant, aerial, campus, educational, warehouse, manufacturing and move, add and change (MAC) work. Copyright © 2019 New Line Communications, Inc.. All rights reserved.